Holidays are among the awaited time of the year. Whether it’s Christmas or Thanksgiving, or even just family and friends simply visiting, it is almost a tradition to prepare something special for valued guests. Some people, especially working moms, often do not have too many hours on their hands but would still love to serve their family with a dish that is filled with love and happiness. Curried butternut squash and quinoa is a simple homemade dish for busy people and yet tastes as if it has been devoted so much time for. All it takes is to make it with as much passion as possible and with help from a little kitchen device we know as blender. 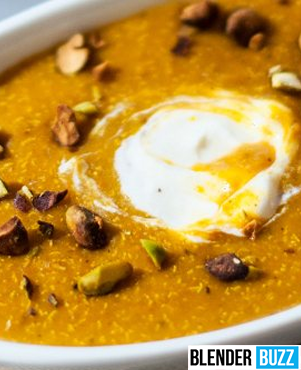 For those who would like to have toppings for their curry, they can choose to add some vegan yogurt along with pistachio, which many people has agreed to be the perfect finishing touch. Cayenne pepper can also be added on the dish but is subject to the preference of the cook. Spray some olive oil on a saucepan and place in the chopped onion. Let it cook for about eight to ten minutes until it reaches a beautiful golden color. Add in the salt, the cumin, curry powder, sea salt, quinoa and garlic into the pan. Stir religiously for about five to ten minutes. Add some squash and vegetable broth, and then let it simmer for about thirty five minutes in low fire. Remove from the pan and let it cool for about five minutes. Add some more salt and pepper if you would like. Take it out of the blender and then serve with your choice of topping. Many people experience garlic sticking to their knife, fingers and all over the chopping board when chopping. To let it just stay where you want it, put a tiny drop of olive oil on the kitchen blade so that the garlic would not stick to it. When shopping for butternut squash, choose one that is fresh out of the farm. With this, you are sure to get the most nutrients and still have a lovely home-cooked meal to serve.